Carillion is back in the news again as the collapse of Westminster civil servants’ favourite outsourcer is pilloried by Westminster committees and the big auditing firms get some overdue scrutiny over their failures. 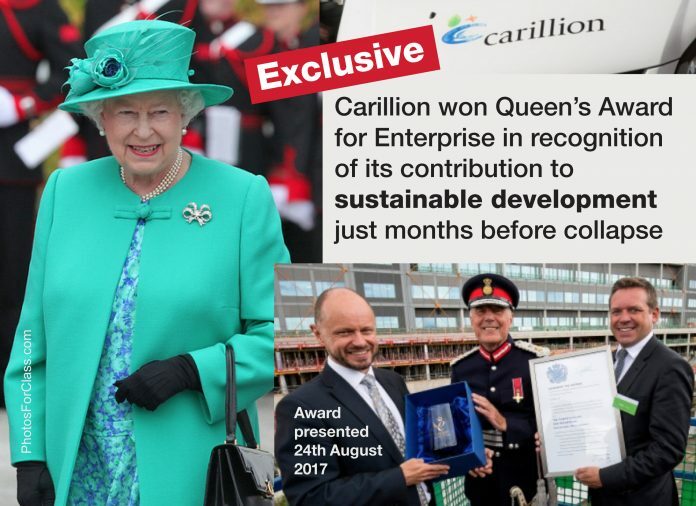 The Queen’s Award for Enterprise in the ‘sustainable development’ category is a particular slap in the face for Carillion’s employees and small business contractors now struggling with their own sustainability issues. This extraordinary award indicates that the civil servants who put these recommendations forward fail to carry out adequate scrutiny of names submitted for consideration. The Queen is not to blame but she has been caught up in an embarrassing accolade to an unworthy recipient due to a lack of vigilance in Whitehall. On the other hand, I have heard a rumour there is a very expensive royal shindig this weekend. The reception, catering, entertainment, decorations, invitations – plus bits an bobs come to £2,436.000. A better example, in this age of austerity, might have been for the Queen to have put her foot down and kept it as a quiet family affair and given £2.4 million to foodbanks to help those left destitute by Cariliion’s collapse. That would have made some amends for the unworthy ‘sustainable development’ award. It would also have cut the massive security bill, estimated at up to £20 million, to that of a normal day. A cost on the public purse better spent on putting a few more police on the streets of a capital city with horrific levels of knife crime. Think about that as the cake is cut Mrs Windsor. Rachel Reeves MP, (an economist and Labour MP for Leeds West) as Chair of the Business, Energy and Industrial Strategy Committee, said: “Carillion’s collapse was a disaster for all those who lost their jobs and the small businesses, contractors and suppliers left fighting for survival. The company’s delusional directors drove Carillion off a cliff and then tried to blame everyone but themselves. Their colossal failure as managers meant they effectively pressed the self-destruct button on the company. The FT commented on the way Westminster contracts are awarded under the Private Finance Initiative arguing they are in need of close scrutiny and overhaul. 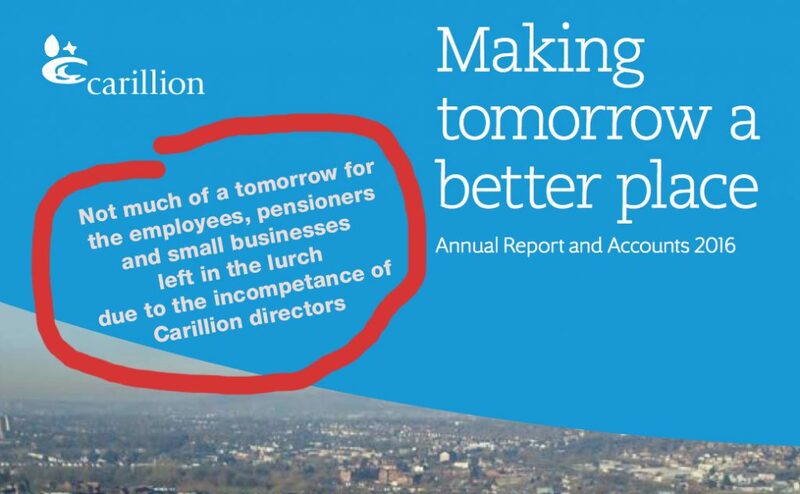 This underlines a blind side in the understanding of risks as Whitehall has mistakenly shown favour to large contractors and awarded further contracts to Carillion after the profit warning, allowing Carillion to promote an over optimistic presentation of its sorry internal finances. Legal firms have also come in for criticism with huge fees paid out for advice. City legal firm Slaughter and May scooped millions as Carillion’s directors, in panic, sought advice to find a way out of their own mismanagement. 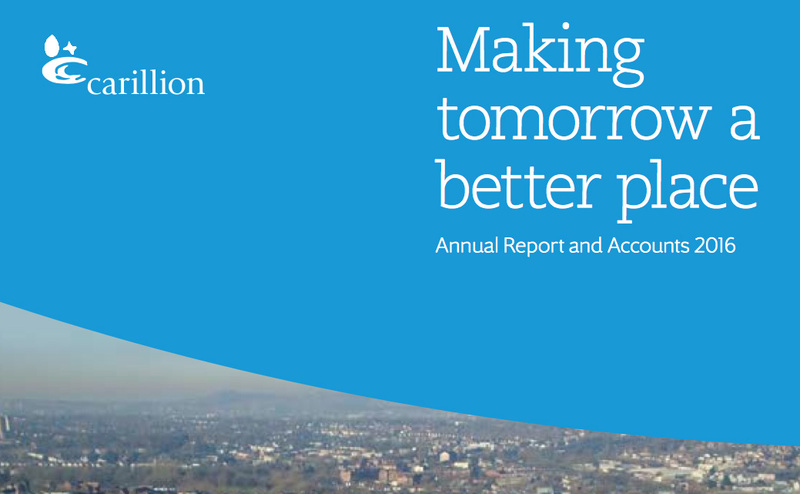 The result – an £8m bill using money from Carillion’s rapidly declining cash resources. “Same old story. Same old greed. A board of directors too busy stuffing their mouths with gold to show any concern for the welfare of their workforce or their pensioners. They rightly face investigation of their fitness to run a company again. Postscript: A little known fact – Frank Field came from a family of working class Tories. He left the Conservative Party in 1964 over his opposition to Apartheid in South Africa.